SWS second graders, many parents, and some area bicycle enthusiasts spent a beautiful afternoon biking around Capitol Hill and picnicking in Lincoln Park on April 14th. 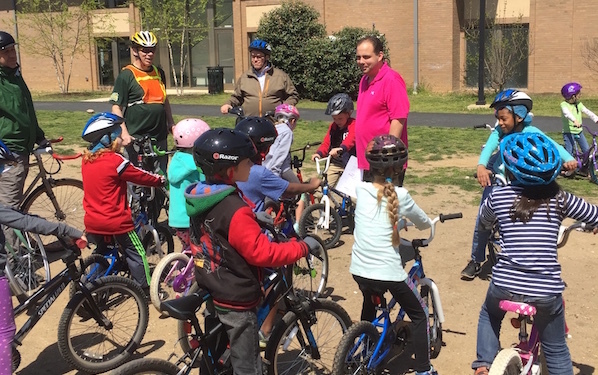 This fun and healthy day was the culmination of a month-long bicycle unit, part of the D.C. Public Schools Cornerstones program that aims to teach every second-grader across the city how to ride a bicycle. At SWS, that was a feat for some students that were just barely able to ride or hadn’t ridden at all before the unit started. DCPS loaned SWS some bikes for students who didn’t have them, but most second graders brought their bikes every Thursday for a few months and received instruction from Mr. Chapman, our PE teacher, on riding technique and safety. Mr. Chapman was patient and encouraging with our students throughout the unit and on the trip, many who could barely ride a month ago were steady, confident, and riding with the rest of the group on the bike trip! Capitol Hill drivers were mostly patient and supportive of the streams of young bikers. One driver stopped at a light cheered the kids on as they passed her. 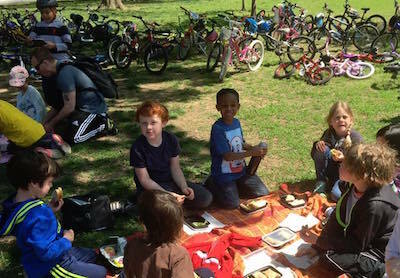 As a stop on their bike ride, the second-graders had a trash-free picnic lunch in Lincoln Park, an effort lead by Ms. Fineran, FRESHFARM FoodPrints lead teacher at SWS, as part of the school’s environmental literacy efforts. 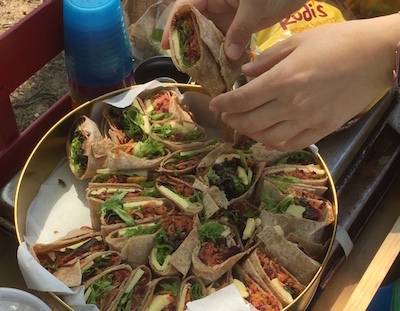 Ms. Fineran used the preparation for the picnic – and the picnic itself – as a way to teach the second graders about reducing trash, how to prepare and store items with reused containers and less packaging, and what a truly “trash-free” meal could look like. Students prepared wraps and salad, and reused teachers’ take-out containers to package the food for the trip to Lincoln Park. Some of the recipes used were Lemony Hummus (a recipe by Cris Comerford, White House Executive Chef, from the children’s cooking magazine and website ChopChop) and our yummy salad recipes (including ABC Salad) that were turned into sandwich filling to make them easier to eat. Ms. Scofield’s class had fun making the fillings, and Mr. Leavitt’s class was in charge of making the sandwiches and packing it all up for the ride. 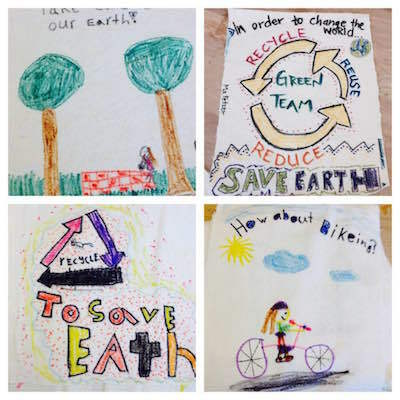 Ms. Fineran also had the students decorate napkins with messages about taking care of the earth, biking, recycling and other environmental themes. She will re-use these napkins in the FoodPrints kitchen at school. Ms. Fineran will continue helping students understand how much food waste we produce and encourage the school community to reduce with a new set of four bins in the FoodPrints room: a bin each for trash, cooking compost, compostable plate waste, and recyclables. “I’m beginning to think we all need to celebrate the earth for the entire month of April not just one day, which is what I’m planning to do with the students of SWS in FoodPrints this month,” she says.